About Us - Power Line Industries, Inc.
Manufacturing and Distributing Pressure Washers Since 1972. Power Line has sold and serviced nearly every national brand of power wash equipment made. In dealing with numerous manufacturers we found that most of them build great electric powered units, however – finding an “Industrial Grade” mobile “skid” unit that could hold up to the rigorous demands of industrial and commercial applications was nearly impossible! In the mid 90’s we began to build our own “skid” pressure washers and complete power wash trailer systems from the ground up. Power Line Trailer Power Washers are designed to prevent the common breakdowns experience by other industrial equipment and with Power Line’s unique “EZ Service” engineering designs, regular maintenance time is reduced. All equipment is extra reinforced to help prevent damaging vibration and standard sized parts ensure your investment is protected. We build the finest trailer pressure washers on the market. Our Power Wash Trailers have been industry proven to be the Highest Quality, best performing units available! Our #1 goal is to build a quality-engineered machine with operator safety, easy service, great performance and most of all at a great price! Today the company manufacturers industrial strength pressure washers and trailer pressure washers that meet the highest standards of the industry from the tough rental and mining applications to the high performance standards of commercial transportation. SAFETY. With triple redundant safety features engineered to protect your equipment and your people you experience reduced down time from breakdown or injury. Our exclusively engineered safety features include high heat limit, thermostat shut-off system, trigger shut-off controls, cold water release on master relief valve, clean burning, and energy efficient engines. We are deeply involved in the engineering process for each equipment model we produce. We engineer our equipment for the highest level of performance at the best price with quality components you can count on to work hard day after day. ENVIRONMENTAL ENGINEERING. Our environmental compliance features help you to maintain quality standards for air, water conservancy, and road safety through Cal-air compliant heating coil systems and engines, and all equipment built on DOT compliant heavy duty trailers. WARRANTY. 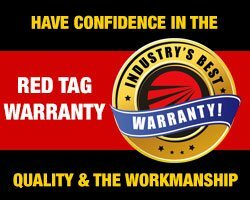 We have the longest warranties in the industry with service partners around the country for quick and cost effective repair, parts, and service. With each equipment purchase our customers receive lifetime wholesale pricing on parts purchased through our manufacture direct location. VALUE. Better equipment equals more years of service which equals Best Return on Investment. WHITE GLOVE DELIVERY SERVICE. You get a team of experts that provide end-to-end service and support; design, production, quality assurance testing, operations and safety training and white-glove shipping service. White glove service allows you to focus on fluent service to your customers when you receive your equipment turn-key ready to go to work right off the truck. TRAINING. 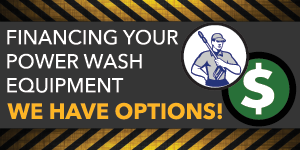 Unlike other pressure wash equipment suppliers out there, we can provide safety, and operations training to every new equipment owner… We are invested in the success of each owner. In our training and through our business support services we add our 30++ years of experience to enhance the business and marketing knowledge of our customers. With training and know-how, our customers experience greater profitability. Get More Info about Our Power Wash Business, Safety & Operation Training. DEDICATED SUPPORT TEAM. Your Dedicated Support Team is a group of skilled, highly specialized experts who know and care personally about your business; professionals who are able to convert your real needs into specific solutions. Your Support Team is responsible for managing and implementing equipment and product solutions that can truly make a difference for your business. With over 30 years in the pressure washing industry, intense investment in engineering equipment to meet the needs of thousands of business owners, just like you, and level of interest that ensures each equipment owner has the right tools to get the job done right! 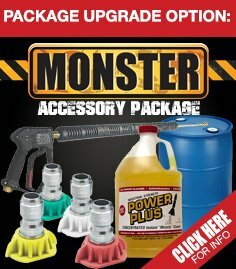 Obviously, you’re getting more than just another piece of equipment when you purchase your equipment from Power Line Industries, you’re getting a complete package designed to support maximum success. 1. You can easily operate, and maintain your equipment. 2. Have the least amount of down time as possible. 3. Fast and inexpensive repair. 4. You and your technicians are safe from injury on the job. 5. Reduced wear and tear on the equipment increasing longevity. Remember, Power Line Industries, Inc. can set you up with a double or single axle trailer pressure washer depending on what your needs are. Please browse our standard models and custom models.